What Are the Most Popular Forms of Clean Energy? Renewable energy and clean energy are terms in common circulation, yet it’s not always clear what these terms mean. We’ll define clean energy in this article. While there is no official definition of this term, a fair way to define clean energy is energy that does not pollute either the air or water with any of its waste or by-products. What Is Not Clean Energy? When people think of coal, they probably think of soot and gray-black smoke. Along those lines, coal is the definition of dirty energy because of the pollution that comes from its burning. Likewise, oil-based energy does not get the “clean” badge for obvious reasons. Among the many issues with “black gold” is the fact that the fuels it is refined into when burned for use in cars or similar machines, send dangerous amounts of carbon dioxide (CO2) into the atmosphere. Further, even “natural gas” falls short because hydraulic fracturing (“fracking”), the process that pulls it from the ground, emits an incredible amount of methane, which, like CO2, is very bad for the environment. Now that we've disqualified certain forms of energy from being clean, we can see that some of the obvious candidates remain, many of the same that are considered "renewable." Here are the workings of these. 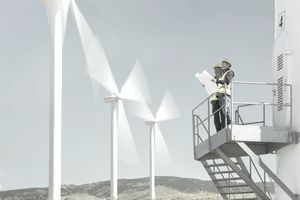 Wind Energy: The concept behind wind energy is taking kinetic energy––energy caused by motion from the wind––and turning it into usable energy for human beings. When the wind hits the blades of a turbine (sometimes thought of as a windmill), it causes the blades to move. This turns a drive shaft that in turn activates an electric generator that produces energy. Forty-one percent of additions to the U.S.'s energy grid since 2015 is in the form of wind energy; there are greater than 52.000 wind turbines in use in the U.S. Pros of wind energy are the same for every renewable energy, the renewable nature of them (not running out of wind as we'll run out of oil) and their lack of emission of greenhouse gases. Cons can include the noise of the turbines and the land required for them. Solar Energy: Taking in energy from the Sun via solar panels and turning it into energy is on the rise. for example, solar power grew on average of 59 percent each year from 2006-2016. Solar power can be used for energy of numerous varieties––even powering cars. In 2015, it accounted for 1 percent of the world's power and is growing all around the globe. Because the process of turning solar energy into power doesn't involve any combustion, it emits almost no greenhouses gases––again, the standing "pro" for all renewables. As for cons, the consensus is that this form of energy remains expensive. It may be the case that the price of solar panels has been declining. But that doesn't necessarily make them affordable for average households, businesses, and communities. Further, the cost of electricity in areas where a great deal of electricity is generated by solar power can be high. That's an issue that demands an innovative remedy. Hydropower: Believe it or not, hydropower is the most commonly-used type of renewable energy. It generally involves hydroelectric mechanisms placed into bodies of water. International Energy Agency statistics from the end of 2017 report that hydropower makes up 17 percent of the world's total electricity production. China is the world's largest producer of hydroelectric power. Some of the positive aspects of hydropower can nearly go without saying––its qualities of being clean and renewable––however, it has other advantages, too. Unlike solar panels or farms of windmills, hydroelectrical systems offer modulation. They can be modified to be larger and to produce more power, or smaller, producing less, as a community's needs may change. After the initial costs of installation are in the past, hydropower is also relatively inexpensive. As to the cons, the chief one is the fact that reservoirs used in the production of hydropower seem to cause the emission of methane. It would be a red-alarm con if not for the fact that this issue requires further study. Researchers believe that the hydroelectric power reservoir emits vast quantities of carbon dioxide and methane. The areas near the dam are full of water, and the plants underneath the water begin to rot and decompose. This kind of decomposition without oxygen involvement gives off vast amounts of carbon dioxide and methane, which leads to an increase in pollution levels. In the future, we'll have a more definite answer to this question, and if the production of hydropower continues to lead to significant methane, this type of power will have to be crossed off the clean energy list. Can Clean Energy Clean Up the Environment? The global warming crisis was caused largely by polluting emissions from fossil fuels used in factories, to power residences and businesses, and to fuel cars. The only way to reverse these problems, almost all scientists agree, is to switch to renewable energy as much as we possibly can. As to whether or not this is possible, almost all the predictions are positive. Many forecasts say that most of the world's countries could make a move to renewable energy by roughly 2050. However, lack of investment, or interference from governments and industries, could slow this down. The question, then, would remain, as to whether the problems are already too large. If we meet some ambitious goals for switches to renewable energy, will that be enough? One positive development is that while carbon emissions rose in 2017, the U.S. recorded lower emissions. Since we produce so much of the world's emissions and demand for power, this is very positive. A recent editorial in the Washington Post mentions some of the reasons for optimism, yet points out that there's no time to waste. Do We Need to Change Our Lifestyles? However, not everyone believes that the only issue is what kinds of energy we use. Some argue that people will have to cut back their energy needs, which will include a different approach to living our modern lives. One principle that may have to change is the globalism that requires outlandish amounts of power to transport goods intercontinentally. Thus, while we may try to fight against global warming as much as we can, the development of new technologies may not be the only answer.